Its traditional stone facade and rustic wood windows blend in with the local Cycladic architecture, but it's Myconian Avaton's contemporary design that sets it apart. 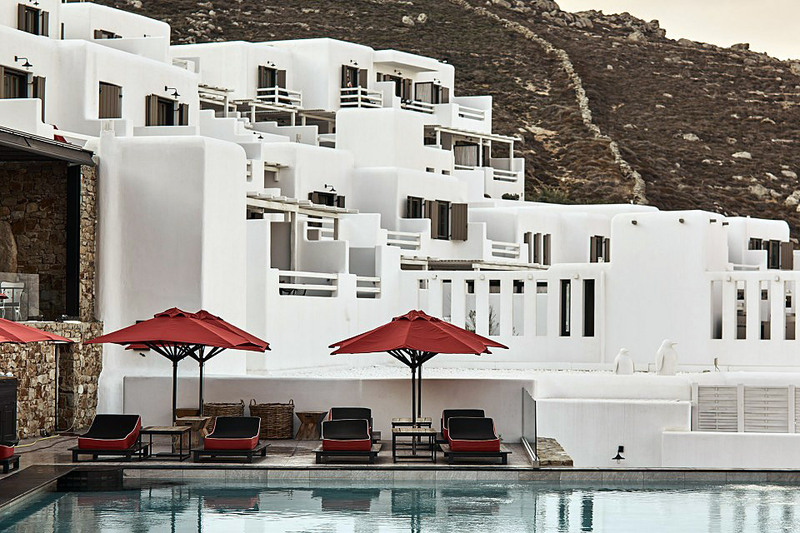 The hotel is perched above Mykonos' Elia Beach, overlooking the Aegean Sea. WIth private terraces and expansive glazing, each of the 85 rooms is immersed in the landscape. Their interiors are furnished with a mix modern and vintage pieces for an overall appearance that, just like its setting, is both luxurious and inviting. An on-site restaurant caps off the experience, serving authentic cuisine made from local produce grown just for the hotel. Iceland is covered in beautiful countryside. It's best enjoyed outside of your vehicle. Designed by Jordi Hans Design, Mink Campers give you the chance to explore the landscape beyond the hotels and towns. The teardrop-style caravan has a powerful Webasto heater to keep you warm, a comfy queen-size mattress, Wi-Fi, a skylight and large side portholes, and a fully-equipped kitchen with a gas stove and Illuminated ice chest/cooler. It's available for rent with or without a vehicle. Tucked away in the Caucasus Mountain Range of northern Georgia, the Rooms Hotel Kazbegi reimagines a former Soviet resort. The old Brutalist building has been restored with a mix of warm woods and steel to create an alpine retreat that is both rustic and industrial. Each of the 155 guestrooms follows the same aesthetic while offering expansive views of the surrounding mountains. Speaking of the views, the dramatic scenery is on display in nearly every space from the sun terrace to the indoor pool. Local fare is served in the on-site restaurant and for dessert, the lobby lounge offers a curated menu of hand-rolled cigars. Accessed by a secret passageway, the Hotel Grands Boulevards is a mysterious getaway in the heart of Paris' bourgeois districts. Its housed in a historic building constructed just before the French Revolution. The ground floor contains the Grand Restaurant serving classic French-Italian country cooking. The 50 guestrooms pay homage to the building's origins with handmade canopy beds, glass cupboards, and red marble while also introducing modern touches like personal espresso machines and organic coffee. Wedged between the city of Rio de Janeiro and Copacabana beach, the Hotel Emiliano offers the best of Brazil. The building is wrapped in perforated white screens. The oblong holes filter in the natural light while maintaining privacy for guests. Each of the 19 rooms features and airy atmosphere with soaking tubs and luxurious beds while a spa suite is equipped with a private sauna and personal massage room. The heartbeat of the hotel is on the rooftop. The open-air space houses a restaurant, wet deck, and glass-front infinity pool that affords views spanning across the coast from Leme to the Copacabana Fort. With its water views and thick forest setting, the Mökki Santara House is the ideal Finnish getaway. The cottage is located on the shores of lake Santara. Sitting on a single platform, it's comprised of two volumes — the main house and a sauna — joined by a large outdoor terrace. The picturesque Scandinavian interior offers sleeping for four plus a full kitchen, wood-burning stoves, and extensive views of the surrounding scenery. To get the most of the lakeside setting, a small deck extends over the water for swimming and fishing. After being abandoned for almost 40 years, the Lost Cottage is now a lakeside retreat in the Irish countryside. The two-bedroom abode is located in County Kerry, surrounded by 85 areas of rolling hills and green farmland. Almost in ruins, the original structure was painstakingly restored to its former beauty and topped with a red iron roof while a wood grain oxidized concrete extension houses the master suite. Vast amounts of glazing keep the landscape always on full display, allowing guests to watch the sunrise from bed or stargaze below the bathroom's glass roof.